An in-door cat needs stimulation and a window to look out from is always something I try to encourage. 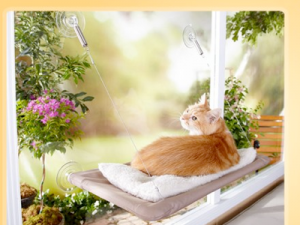 I know, with certain homes, it’s difficult, especially in Central London, with lack of space for a climbing frame or rented properties not allowing built structures so I have found the perfect solution for you and your cat! It’s called The Sunny Seat. Unfortunately not sold in the UK but what a great solution. No marks on the wall, no space on the floor taken up. I am going to buy 2 myself and hope they take very large cats! To encourage your cat to use it you may want to try a heated pet pad ;-). There are plenty to choose from. Just click on the Catnips site under Cat beds. The last few pages are full of different heating pads, some electric and some heated in a microwave!